 Over the past few months, Synergy Global Housing has been hard at work extending our industry-leading serviced accommodations to New York. This meant building an experienced team of short-term furnished housing professionals to respond to the needs of our guests in The Big Apple. It also meant redefining the traditional short stay experience in New York through elevated in-unit packages. Our New York residents will enjoy an enhanced furniture package, as well as a host technology upgrades, such as 200Mbps wireless internet and a 55” smart television and DVRS in each of our core inventoried apartments. In addition to transforming the hospitality ecosystem in New York through our customer support and in-unit packages, Synergy is building an inventory of first-class apartments throughout Manhattan to provide the most supportive housing programs along the East Coast. We have the onsite support to scale our capabilities and build a furnished apartment inventory based on our specific clients’ needs. Synergy has a robust selection of serviced apartments in some of the New York’s best residential buildings, strategically selected based on quality of offerings and location. 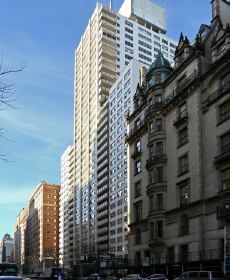 Synergy goes where our guests need us to be, and we are proud to highlight just a few of our impressive properties in Manhattan. Convenience meets luxury in this newly completed housing option that is completely managed by Synergy. Synergy Chelsea sits in an ideal location, where you are housed right in the middle of everything you would need in Manhattan. The 7th Avenue subway station at 23rd Street is right on the corner, providing easy access to all parts of Manhattan, and a Whole Foods is only a half-block away for your grocery needs. New commercial developments are constantly going up alongside the more than 200 art galleries in the neighborhood. Chelsea truly is the perfect combination of business and pleasure for the traveling professional. This recently updated property oozes an atmosphere of luxury the minute you step inside. Resort-style amenities such as a 24-hour concierge desk, state-of-the-art fitness center, onsite coffee shop, arcade corner and gold golf simulator are only some of the high-end touches that elevate the residential experience. 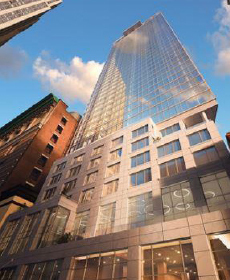 The Eugene is 62 stories tall, making it the tallest rental building in midtown Manhattan. The Hudson Yards is by far the most active neighborhood for new developments in Manhattan, with several technology companies establishing a presence in some of the area’s commercial buildings. This economic development is creating an active after-work social scene along its famed restaurant row. This charming low rise building is located in the heart of the Theater District, and only a few blocks from major subway lines, local markets, restaurants, theaters and world-famous Time Square. 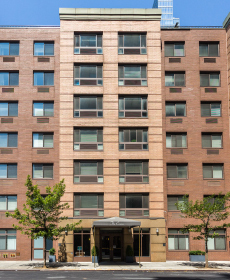 A 24-hour doorman greets residents, who have access to a fitness center and spacious courtyard garden. The Theatre District is a bustling area with trendy entertainment offerings from the nearby Broadway theaters, and surrounding social spaces. The neighborhood also includes recording studios, television studios, theatrical agencies, a Ripley’s Believe It or Not! Odditorium and Madame Tussauds of New York. 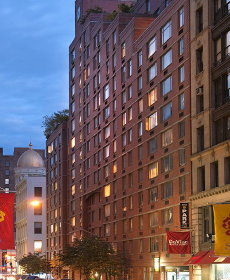 Live music and a hip, modern vibe define The Chrystie’s surroundings, where the East Village, NoLita and SoHo all meet. Guests will feel instantly at home with The Chrystie’s friendly 24-hour doorman and concierge. Amenities such as a billiards/ping pong room, swimming pool, indoor basketball court, outdoor grilling space, fitness center and resident lounge are available for an additional charge. Step outside The Chrystie and experience a more laid-back approach to the traditional Manhattan stereotype. The area is not filled with skyscrapers and business ties like you’d find in Midtown, but instead hosts several low-rise buildings with color and personality. Want to see one of the best views of the world-famous Empire State Building? The Solari is for you! 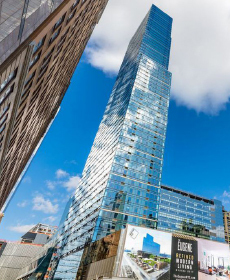 This 41-story, 500-foot Midtown tower sits directly across the street from one of the world’s most iconic buildings, and offers guests access to one of the most modern and luxurious living spaces in Manhattan. It seems no expense was spared when the building’s amenities and finishes were installed earlier this year. High-end amenities such as a fitness center, swimming pool, spa, sauna, outdoor theater and terraces are spread throughout the building, while in-unit features include custom Italian Stevali cabinetry with soft-close technology, Caesarstone countertops, stainless steel appliances and hardwood floors imported from Spain. 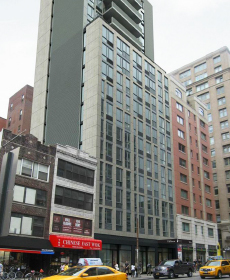 All of the conveniences of being in the East Village are accessible in this 17-story apartment building. New York University is only blocks away from the Mayfair, taking you through one of the most artistically-rich sections of America. Andy Warhol, the Velvet Underground and CBGB all sprouted from the late 60s-early 70s art scene in the East Village. While some of that left-of-center mentality has declined in recent years, the area retains an active atmosphere from its local universities, parks and gardens, and lively music venues. 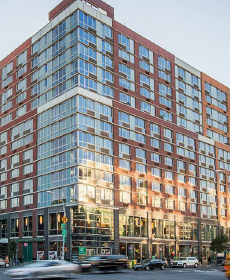 Like Synergy Chelsea, this upscale apartment building sits in the vibrant Chelsea neighborhood of Manhattan. These furnished apartments include hardwood floors, stainless steel appliances on the inside, and a spectacular rooftop terrace and grilling station on the outside. 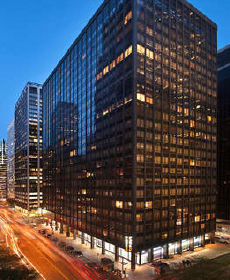 Other amenities include a 24-hour doorman, bike storage, fitness center, spacious residents lounge and on-site laundry. Blocks from the New York Stock Exchange sits 95Wall, a 22-story apartment building featuring high-end touches to match the sophistication of the surrounding Financial District. Residents can unwind from a long day by rising above the chaos of Wall Street – both literally and figuratively – with 95Wall’s large rooftop lounge and workout facility. Amenities include bike storage, on-site concierge services, valet laundry and a sun deck. The Financial District, near the southeastern edge of Manhattan, is home to several of New York’s major financial institutions. Don’t let the stereotype fool you however, as an active evening social scene attracts a diverse collection of locals concerns with more than bear and bull markets.